You are here: REDWOLF > Home > News >News Detail - Airsofting for Charity! Taking place at the Sennybridge FIBUA village on the 8/9 August; Members of a corporate private army, US Army troops, a Government Special Operation team, the CIA, and a town population armed to the teeth are all getting thrown in to the mix to create the charity event of the year! As well the main 24 hour event there will also be a pistol and shotgun competition on the Friday night. All proceeds go to the Bamako Bampots charity which aims to provide medical assistance to villages in Mali. Don't miss out on the event of the summer and it will only cost you £65 ticket (includes entry to the Friday night competition). After a conspiracy theory is published on the World Wide Web concerning the details of a biolab, human testing and all located within "small town USA" then it was only a question of time before it was scooped up by the tabloids and national media. No one could have guessed how far the shockwaves were about to travel as the events that followed were beyond what most people could have imagined. But then when you throw in a corporate private army, US Army troops, a Government Special Operation team, the CIA, and a town population armed to the teeth, then things can only be described as "slightly delicate". The Uprising it's going to be an Airsoft tour de force!!! A competition will run by the Airsoft League between the hours of 1800 and 0200 on the Friday night. The competition will pit up to 20 teams of 5 against each other in a pistols and shotgun only timed event. The winners of this Charity league game will receive a Trophy and 2nd and 3rd place will receive runner up prizes. Four very different sides interlocked in a very volatile situation during an intense 24 hours of adrenaline pumping, arse kicking action?.and that's just the basis of what's to come. This event has so many twists and turns you will never know what's waiting around the next corner. This is a one of, special event brought to you by BamakoBampots and sponsored by TA Events. To miss it would mean missing one of the major events of 2009. The main game will run from 1030 Saturday through to 12 noon Sunday the next day and being MILSIM will not stop during the night. Ambient low level lighting ( red low watt) will be placed at certain points around the village to ensure that those without NVG can move and play safely whilst ensuring enough darkness that those with NVG and torches can still play strategically. * Civilian forces - Green DPM and anything that would be taken from an army surplus store. As you know we are a registered charity who's aim is to provide a remote area of Mali, Africa with critical primary care. Working with the Rotary International we are providing the community with 2 landrover ambulances and an 8 building medical complex complete with 600 watt solar power array and pumped water. Currently we have raised enough to purchase the 2 landrover ambulances, the first of which is complete and the second is in the process of reassembly after the reconditioning and chassis work. These landrovers will operate from the clinic and act as a remote field clinic for the outlying areas ( approx 70 miles radius ). Being staffed by nurses and doctors from the Rotary International we can ensure that every single penny that is donated is used soley for vehicle preparation and provisioning. Redwolf Airsoft are collaborating with WearTheFoxHat.org.uk to run a charity raffle, with all the proceeds of the tickets sold going to the Bamako Bampots charity. 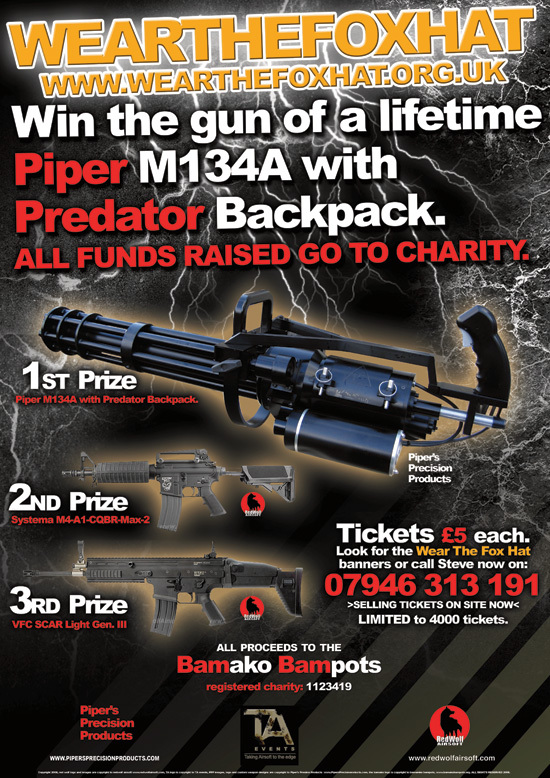 The 1st Prize has been kindly donated by Piper Precision Products and we have donated 2nd and 3rd Prizes in the form of a Systema M4A1 CQBR MAX2 and VFC SCAR Light Gen. III, respectively, as well as a Deep Fire M72A2 (Plastic Version); Cavalvy Elite Tactical Headset and an HFC M190 Special Forces (Full Metal, Full Auto). Bamako Bampots are a UK Registered charity working in Bamako, Mali. Working with the Rotary International charity in Mali they are trying to raise £30k which will provide the nurses with field ambulances to service the remote villages most of which have to travel 75 miles by foot for any medical aid. These Ambulances will be an essential lifeline to the 49,000 people in those villages. By kitting out the ambulances and deliverying them direct to the doctor and nurse teams they are ensuring that no social corruption gets in the way of the Relief Aid. Tickets are ₤5 sterling and is strictly limited to 4000 tickets. You can purchase a ticket above or you can contact Steve on: (+44)7946313191. Everyone is welcome to purchase a raffle ticket, although non-UK residents will be required to pay for shipping for the Prizes (as they are currently located in the UK right now). Once all the tickets are sold out there is a 1 month period for external audit ( because they are a registered charity) then the draw will be made. Pass the word and your team could win a whole host of goodies whilst helping a good cause.